Enjoy sleek, cutting-edge design alongside confidence and control with the new GROHE Plus range of modern faucets. Refreshingly different by design, this innovative range of unique faucets offers a new level of ergonomic comfort and practical function. The GROHE Plus range includes some faucets with an LED temperature display, so you know the water will always be just the right temperature. GROHE Plus is a design that takes its inspiration from the arc, a shape that offers both strength and lightness. By combining the curves of a circle and the crisp, clean lines of a cube, GROHE Plus creates an exciting, architectural silhouette, ideal for innovative bathrooms. GROHE Plus represents accuracy, strength and stability, coupled with features that offer comfort, convenience and control. The control of your faucet is completely in your hands with GROHE Plus, thanks to its innovative LED temperature display. Always know how hot the water from the faucet is, moment to moment, thanks to the LED temperature display on the top of the faucet, giving you increased control and security for the bathroom. You can tell at a glance how warm the water is, but when the flow stops, the clever display disappears again, leaving the immaculate appearance of the faucet unchanged. The Eco Spray function, delivering a sustainable 4L/min, can be switched to effortlessly at any time. Simply swipe your hand in front of the lit icon to reduce water usage without compromising your comfort or enjoyment. The gentle, soothing spray is gentle on your hands and, combined with the swivel spout, is also perfect for cleaning the sink. GROHE Plus redefines the notion of flexibility for a modern bathroom faucet, thanks to its pull-out spray. Perfect for rinsing the basin, washing your hair and more, this innovative bathroom idea means you are no longer tied to the basin. 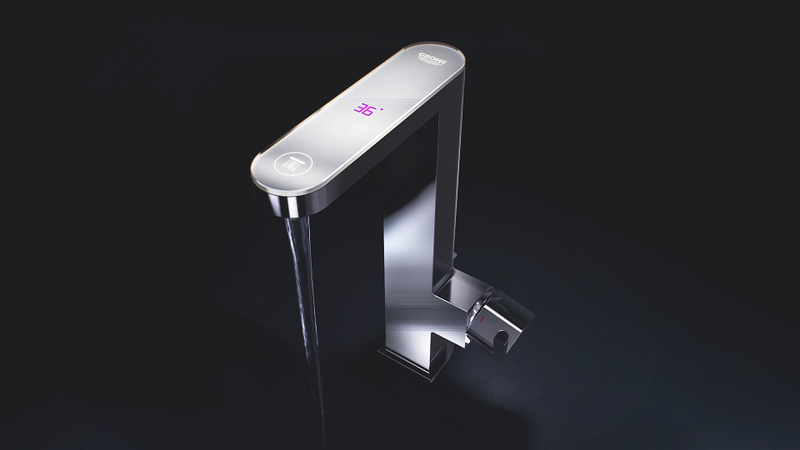 GROHE EasyDock means that once you are finished the spout retracts easily and smoothly back to its starting position. Enjoy greater user comfort and flexibility thanks to a 90° swivel spout. Turning smoothly to left and right, the swivel spout adds a whole new level of convenience, allowing you the space to wash your face or soap your hands unhindered. GROHE Plus takes its inspiration from the arc, an architectural icon, a shape that offers both strength and lightness. The tactile curves of this modern faucet make it an ideal fit for other round elements in the bathroom, from showerheads to basins. By combining an arc and a square in the conception of the GROHE Plus silhouette, the design creates a unique faucet, ideally suited to both round shapes and crisp, cubist styles, fitting effortlessly next to square showerheads or cube-shaped basins.